Aleksandr Deineka‘Work, Build and don’t Whine’, 1930. Opening on June 18, a new exhibition at London’s GRAD Gallery looks at images of women in Soviet propaganda, from the beginning of the Russian Revolution in 1917 to the end of perestroika in 1991.
Who do you see when you think of women in the Soviet Union? Do you see a worker, a communist, a wife, a mother? Or maybe she was a soldier or a cosmonaut? Soviet women were all this and more. GRAD Gallery in London has arranged a special show dedicated to the legacy of these “superwomen,” with an exhibition, talks, film screenings and other programmes. 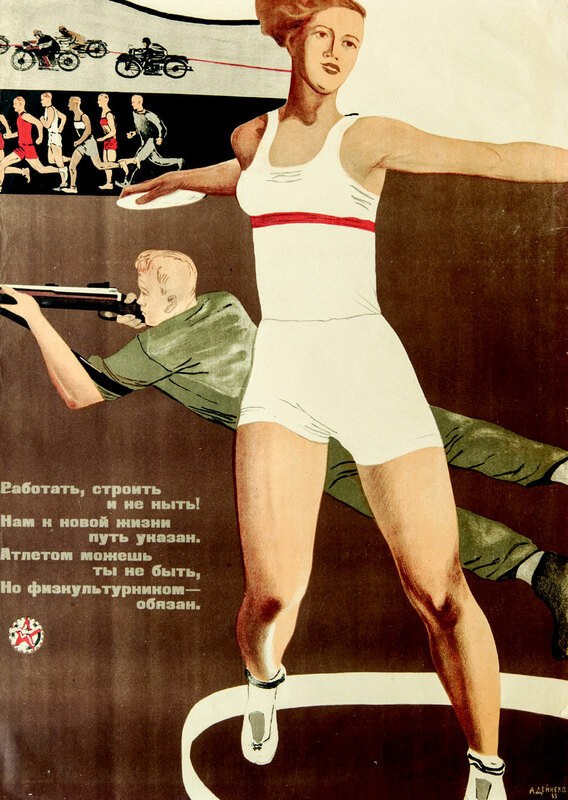 The gallery will feature ceramics, film, photographs, photomontage, postcards, posters and sculptures from Soviet propaganda until September 17, as part of an exhibition called “Superwoman: ‘Work, build and don’t whine.’” This slogan was used to motivate women to feel invested in the new communist order. Women were heavily involved in the first revolution of 1917 in Petrograd (now St. Petersburg). On Women’s Day, February 23 (March 8 using the updated calendar), women joined a group of factory workers to protest food rationing by the tsarist government. Russia became the first major world power to grant women the right to vote and legalized abortion in March 1917. The first Constitution of the Soviet Union, published in 1923, officially recognized equal rights for women, including equal pay. After the Soviet Union was founded, revolutionary Lev Trotsky began to create the image of the “man of the future” and that of a “superwoman.” Just like men, women had to be equally selfless, educated, healthy, muscular and enthusiastic in spreading the socialist Revolution. At the same time, Soviet women were also pushed to continue bringing up their families and running their households. After World War I and the Civil War in Russia, the ratio of women to men grew substantially. By 1926 there were 71 million males for nearly 76 million females. A great deal of the burden of helping Soviet leader Joseph Stalin attain his economic goals of rapid industrialization, therefore, fell on women. The number of women in the workforce jumped more than fourfold from nearly three million in 1928, when Stalin announced his first industrial Five Year Plan, to over 13 million in 1940. These events, coupled with the enormous loss of life suffered during World War II, meant that women of working age heavily outnumbered their male counterparts by a staggering 20 million after the war. As many as 57 percent of those active in the labour force between 40 and 50 years of age in 1959 were women. It became the norm for women to work outside the home. “Soviet women faced two major challenges: they were under pressure to both work long hours and, at the same time, they had to help Russia expand its population by producing as many children as possible,” the exhibition curator Dr. Natalia Murray told RIR. Since Russia had always been a patriarchal society, women had to juggle work with all their usual responsibilities at home without relying on help from their husbands. The exhibition takes the stories of the “superwomen” in official propaganda and juxtaposes them with the everyday reality of millions of Soviet women and poses the question, what does it mean to be truly liberated? One of the main highlights is a bronze miniature version of Vera Mukhina’s iconic sculpture of the “Worker and Kolkhoz Woman,” which is on loan from Moscow’s Tretyakov State Gallery. One of the Soviet Union’s most significant female artists, Mukhina originally created her monumental sculpture for the 1937 Paris World Fair. Other highlights include a poster by Aleksander Deineka, one of the leading proponents of avant-garde art for the proletariat, as well as never-before-exhibited archival footage, documenting the “Sovietization” of women in the outlying Soviet republics. The filmography part of the exhibition was curated by Thea Film, a company set up to develop film projects focusing on human issues across diverse cultures. Dolya Gavanski, head of Thea Films, says there are several highlights. Gavanski said the archival footage of women participating in the February Revolution, the work of the Zhenotdel (Women Section) in the 1920s and images documenting the liberation of women from Central Asia provide a sense of the sheer scope and scale of work that women undertook across the Soviet Union.